Fabric Printing for display and trade show supplies Backdrops and Step n Repeat walls, media logo walls and red carpet events all like the anti glare properties of this fabric. Fabric printing for pop up display stands. New and custom re-print fabric displays for trade shows and pop up style expandable frames. Signs Banners Online supply fabric printing direct to customer and can make your fabric prints any size. The most popular fabric to use for standing expand style frame systems is Display Chief DCPU. Graphics and event industry markets are very well served and shipping now to over 100 countries offers you cheaper, faster and top quality signs fast. Anti wrinkle you can pull tight and lock onto the hook n loop fastner... so putting up an expanding wall or hop up type of display is simple. Custom made to suit your requirements, the printing uses a new direct lamination / steam process that embeds the ink into the fabric material. You can fold it, wash it and ship it to many events easily. Anti glare... the Display Chief material is famous amongst photographers and video shoots because they love the non relfective properties and the prints dont 'flare or glare'. Use for a company 'red carpet' or photo booth opportunity, many companies and centers purchase so that at photo shoots etc they can have their product, President or people standing infront of their printed logo on the fabric wall. It's brilliant for that. 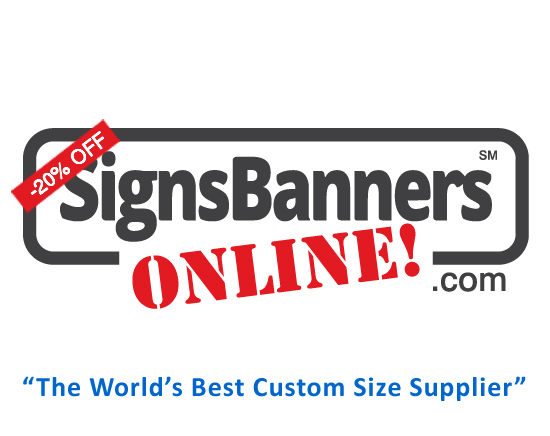 Signs Banners Online will print any custom size and there is no miniumum order. They offer a terrific service for trade show companies and attending businesses. New and re-print SBO offer a great way to get new creative graphics on your existing stands too. Choose your custom size and begin. They can make anything.